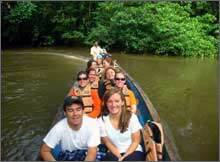 Ecuador's diverse landscapes and cultures inspire visitors from around the globe. The small country is tucked into the northwestern corner of South America, straddling the Andes. The mountains run north to south dividing the country into three distinct regions and hundreds of microclimates. Quito, the capital, lies in the heart of the highlands in a valley surrounded by glacier topped peaks. The city was founded by the Spanish conquistadores in 1534, but according to the old legends, Quito had been a capital for centuries before the arrival of the Spanish. To the west of Quito, the Andes drop into coastal forests and plains. About 97% of Ecuador's population lives in the highlands and coastal region. In the East, the Andes fall into the sparsely populated Amazon Basin. Ecuador's diverse population is descended from many different groups of indigenous peoples, Spanish and other European colonists, Africans brought to the Americas as slaves, and Asian immigrants. Ecuadorian culture reflects the rich tapestry of customs from all these groups, from the beautifully preserved churches and cathedrals built by Spanish colonists to the traditional dress worn by many indigenous people and the colorful seasonal festivals throughout the country. ELI partners with dozens of organizations in Ecuador to give volunteers and interns the opportunity to learn about this beautiful country in depth while giving back to the communities in Ecuador. ELI Abroad works at a medical center operated by the Quito Department of Social Services. The center has many departments as well as an emergency room and outpatient surgeries. It serves people who lack private health insurance or the funds for private care. If you're more focused on Public Health, the center offers many public health services and outreach projects: supporting groups for seniors, families, youth, HIV, gender equality. In addition, the center provides workshops and therapists to help people suffering from domestic violence, sexual abuse, etc. Interns and volunteers may rotate among the different programs, or choose a specific emphasis. Illegally trafficking animals is a billion dollar business in Ecuador. Thousands of birds, monkeys, tortoises, bears, and other animals are caught each year and sold on the black market. The animals that are recovered need to be rehabilitated before they can be reintroduced to the wild. We work with an animal rescue center on the coast of El Oro province near Guayaquil. Participants will assist to clean enclosures, build new enclosures, feed the animals, monitor the animals' behavior, and assist with ongoing reintroduction projects. Three species of sea turtles nest on the Ecuadorian coast and all are threatened by traditional fishing methods. 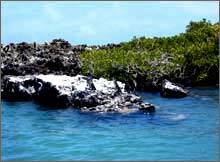 Volunteers with the Sea turtle project will monitor sea turtle nesting activities, record census data, and assist with educational projects for area fishermen. Another important part of this project is to pick up litter on the beaches. The baby turtles can become disoriented by reflective pieces of litter or plastic. They can also die after eating small bits of tar or other litter. In recognition of the importance of learning English, the Ecuadorian government requires English to be taught in the schools, but there are not enough qualified teachers. We work with pre-schools, primary schools, middle schools, and high schools throughout Ecuador to link the schools with international volunteers and interns to teach English and assist with other subjects such as math, science, computer skills, extra-curricular activities and sports. Volunteers will provide a much needed service as well as experience the learning opportunity of a lifetime. Working directly with Ecuadorian students will give volunteers the chance to learn about many of the issues Ecuadorians face every day and a deep understanding of Ecuadorian culture. 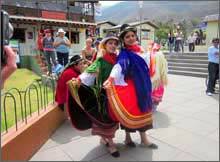 International volunteers also provide Ecuadorian students with the unique experience of getting to know a foreigner and serve as mentors and role models to the students. Teaching opportunities are available in towns throughout the country including Quito, Mindo, Salinas, Puerto Lopez, the Galapagos, Lago Agrio, Puyo, Otavalo, Ambato, and more. The economic crisis of the late 1990s affected almost everyone in Ecuador. 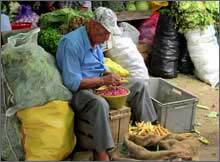 Today approximately 40% of Ecuadorians still live below the poverty line. 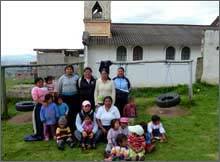 We work with several governmental and non-governmental organizations in Ecuador devoted to giving small communities the tools they need to pull themselves from poverty. Possible projects include helping with infrastructure development, urban planning, educational programs, capacity building, and microfinance programs. Participants will work directly with local government office, NGOs and community members. Volunteers and interns with an interest or background in physical or speech therapy are especially needed. Volunteers in Ecuador stay with local host families. ELI truly believes that this is the best way to fully immerse in another culture and get the most from an international experience. All families are carefully screened and are well-respected members of the community. Host families do not speak English, creating a full immersion environment to help participants improve their Spanish language skills. Participants will have either a private or shared bedroom with secure storage (volunteer must provide own padlock). Bathrooms are shared with the host family. Volunteers will be provided with breakfast and dinner daily. 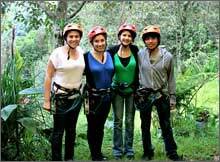 The programs in Ecuador have completely flexible start dates. However, it usually works well if participants can arrive in Quito on a Thursday or Friday. This allows for orientation and getting settled in over the weekend before starting the project on Monday. In December, we ask that participants not arrive December 23-29. This allows our coordinator to spend the Christmas holiday with her family. Most participants will end up flying into Quito’s new airport, Mariscal Sucre International, which is a ways outside of Quito. From there, participates will need to take a shuttle bus found inside the main terminal to the "old" airport. The shuttle bus runs roughly every 30 minutes and costs $8 or so. Our coordinator will have airport pick-up arranged from the "old" airport which is closer to town. The shuttle is much cheaper, and we think, safer then flagging down a taxi to drive you to the old airport or into town. Mariana, the in-country coordinator for Ecuador, will go over this process in more depth about a week before your program start date. Note: Most flights tend to arrive later in the evening. Please try to arrive before 7PM if possible.